Rice Pudding meets all the criteria of a comfort food. That is, it evokes feelings of nostalgia, it is simple to make, uses the most basic of ingredients (milk, rice, and sugar), and tastes good. Looking back to Roman times, Alan Davidson in 'The Oxford Companion to Food' tells us that rice puddings were not eaten daily but were considered a medicine to be used as a cure for upset stomachs. Interestingly enough, although sweetened milk is the basis for all rice pudding recipes, country and culture does influence what type of milk was (is) used and also what spices (nutmeg, mace, and cinnamon) and flavorings (such as rose water, vanilla, orange and lemon peel) are added to the pudding. Nigella Lawson in her lovely book 'How to Eat', sums up the debate on the 'perfect' rice pudding "definitely it shouldn't be gummy, though neither should it be watery; the rice shouldn't be too firm, but it shouldn't be mush either. And between those two extremes, there is room for intense disagreement.". Of course, all would agree that it should be wonderfully creamy so this is definitely not the time to be using skim milk. The question of which rice to use is debatable as there are many choices; long or short grain white rice, basmati, or jasmine. My personal preference is either a long or short grain white rice, the difference being that long grain rice will produce a pudding that is slightly drier and chewier than one made with a short grain rice. A point worth mentioning is that you use a very small amount of rice to milk in this pudding. And that is the way it should be as the rice expands and the milk reduces during cooking so don't be tempted to use extra rice. Lastly, there is always the question of whether there should or should not be a film of top of the pudding? If you are against the film then be sure to press plastic wrap directly on the surface of the pudding right after it is cooked. Leaving the rice pudding uncovered until it has cooled will produce the skin (film). Either way is delicious and you can enjoy this pudding hot, lukewarm, or even cold. 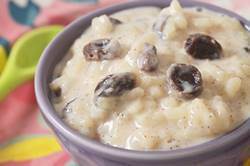 Rice Pudding: In a medium heavy bottomed saucepan combine the milk, rice, and salt. Place saucepan over high heat and bring to a boil. Reduce the heat to medium to medium-low and simmer until the rice is tender (about 25 minutes). Stir the milk mixture frequently using a heatproof rubber spatula or wooden spoon to prevent the rice from sticking to the bottom of the pan. When the rice is tender (al dente) remove from heat and add the sugar, vanilla extract, and ground cinnamon. Return to heat and cook until the rice pudding thickens, about 5 to 10 minutes. Remove from heat and add the raisins. Spoon the pudding into your serving bowls and cover with plastic wrap. If you want a film or skin on the puddings, allow them to cool before covering with plastic wrap. Refrigerate until serving time, about 1 to 2 hours.